Huawei MatePad moniker has been filed for trademark by the Chinese manufacturer with European Union Intellectual Property Office (EUIPO). Since the name has only been applied for trademark, there is no information available on the specifications of the phone. The name suggests that the company could be gearing up Mate series flagship tablets. 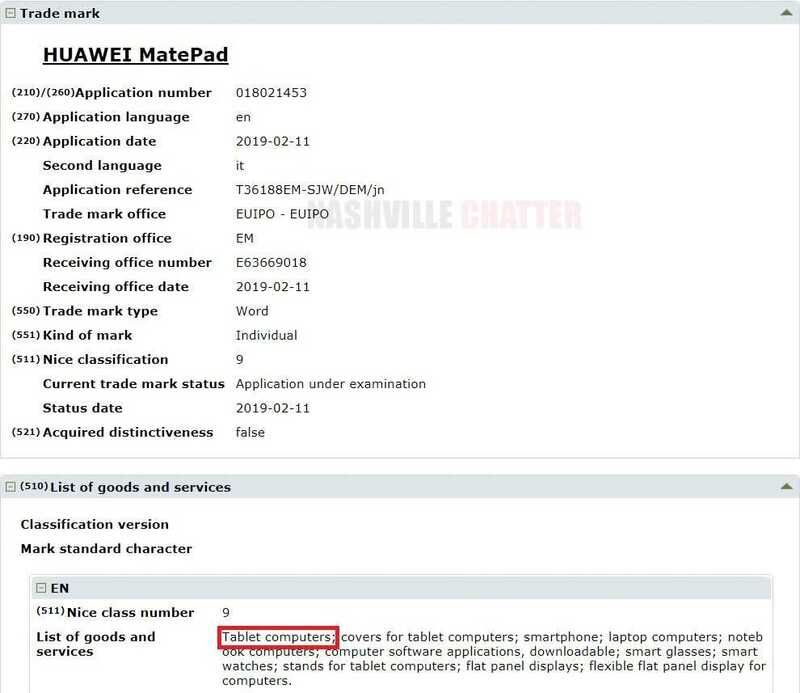 Huawei has been selling tablets under the MediaPad brand name, but the new EUIPO filings reveal that the company may launch MatePad tablets in the near future. The description of the MatePad in the EUIPO applications that it is a tablet device. Huawei is known for launching the Mate series of flagship phones in the last quarter of the year with topnotch specifications. Hence, the forthcoming MatePad tablet could be packed with flagship specs. Samsung has been selling the Galaxy Tab S-series tablets with flagship specifications since the past few years. This year, the South Korean company will be debuting the Galaxy Tab S5 tablet. Since Huawei is one of the major rivals of Samsung, there is a possibility that it could be prepping up the MatePad tablet as a worthy rival for the Galaxy Tab S5 arriving later this year. Probably, the MatePad tablet could be fueled by Kirin 980 chipset and it may feature some exciting specs like dual camera and kickstand. It is advisable to wait for further reports before confirming whether the MatePad will really feature advanced specifications and features. Huawei is now gearing up to introduce its 5G enabled foldable phone at the upcoming Mobile World Congress (MWC) tech trade show on Feb. 24, Also, the Chinese firm will be announcing the Huawei P30, P30 Pro and P30 Lite smartphones in the near future. While the P30 Lite mid-range phone is expected to go official by the end of this month or early March, the P30 and P30 Pro are expected to get announced on March 28.